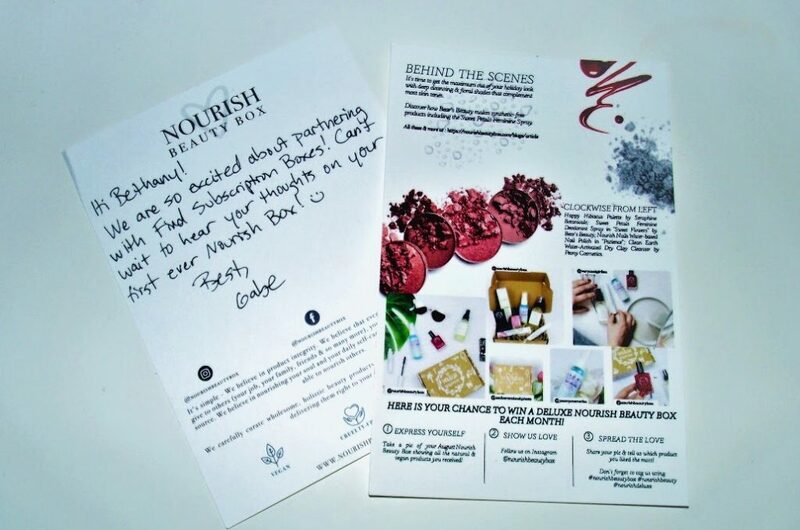 Nourish Beauty Box is a subscription box that prides itself on the natural products they have. Each month you get four full size items that they have selected specifically for you! The price is $29.95 a month and they have options for monthly, three month, and six month subscriptions. The higher you prepay, the better the discount of course! They also have an amazing option on their site called build your own box. For build your own box you can choose any four items from their list and you get 40% off! Today I am reviewing the August beauty box I received. To start, the box came quickly and safely. Opening the box, I found an adorable note thanking me for being able to review their box and stating that they hoped I enjoyed it. I just want to say guys you did really well on this box, It is fabulous! I was so happy to find that the individual items were safely wrapped in bubble wrap. It kept everything nice and tight in the box which was a huge help as I did have some glass items in the box. Seriously, so happy to see the use of bubble wrap. So I started by pulling everything out and unwrapping it but at the bottom of the box I found a list detailing what I received in the box! It also included a price list so I know, had I paid retail for my box, it would have cost almost four times what the box itself cost. But now onto the fun of the items themselves. I was excited to see this palette before I even opened it. On normal days I do not wear a ton of makeup but of course I enjoy the times I get to enhance my natural look with touches of it here and there. 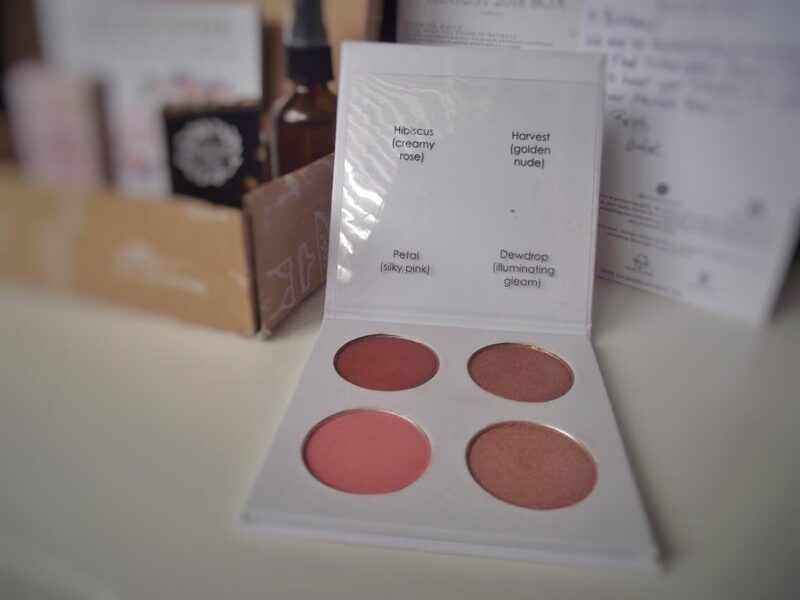 This Seraphine Botanicals blush palette definitely has some gorgeous colors in it. The harvest golden color (top right) is my favorite, but both that and the Dewdrop under it have amazing pigmentation. Petal feels so silky, it definitely fits the silky pink idea. Hibiscus (top left) is probably my least favorite as it would have to act as more of a bronzer than blush on my fair skin. Of course following the Nourish philosophy the palette is cruelty free and natural. I am glad to be adding this palette to my stash. One item I was not expecting to receive was this feminine deodorant spray. 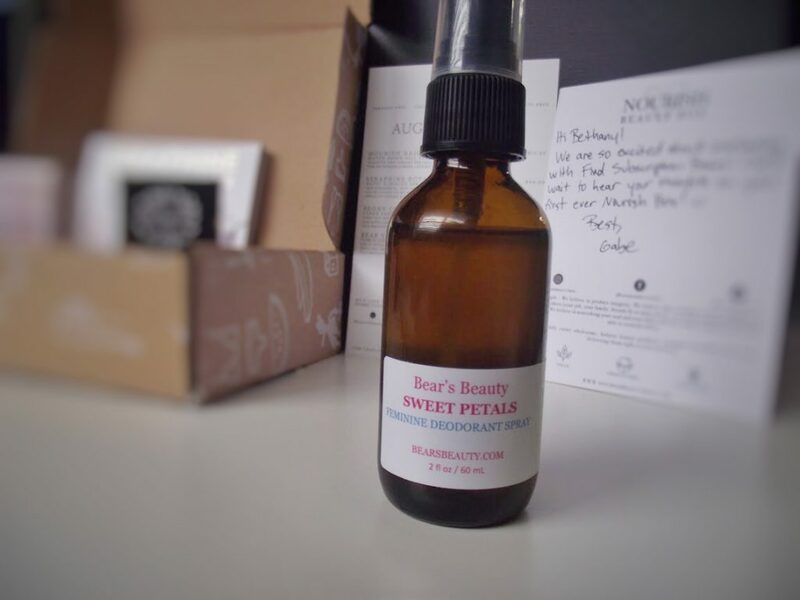 Bear’s Beauty Sweet Petals is made up of a mix of essential oils and probiotics specially combined to help with any chaffing or itching or razor burn! Smell wise it is very strong. There is lots of sweetness to it though which is a bonus. It is a mix of oils of course which can make it a bit greasy so be careful where you spray it. 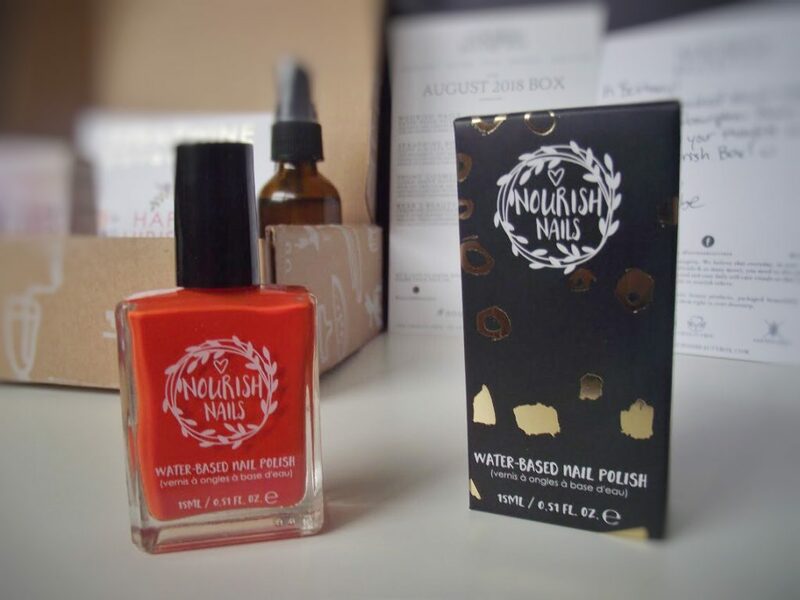 Next up out of the box is Nourish Nails nail polish! This nail polish also keeps up with Nourish’s natural aim. It is a five-free nail polish and water based. The color wouldn’t be my first choice, but it is a really nice opaque polish which I count a a major plus. I will still use this polish and I will be looking into this polish in other colors. Oh, one last thing I wanted to throw in, because it is such a nice natural polish it doesn’t have the harsh smell that comes from your normal polishes! 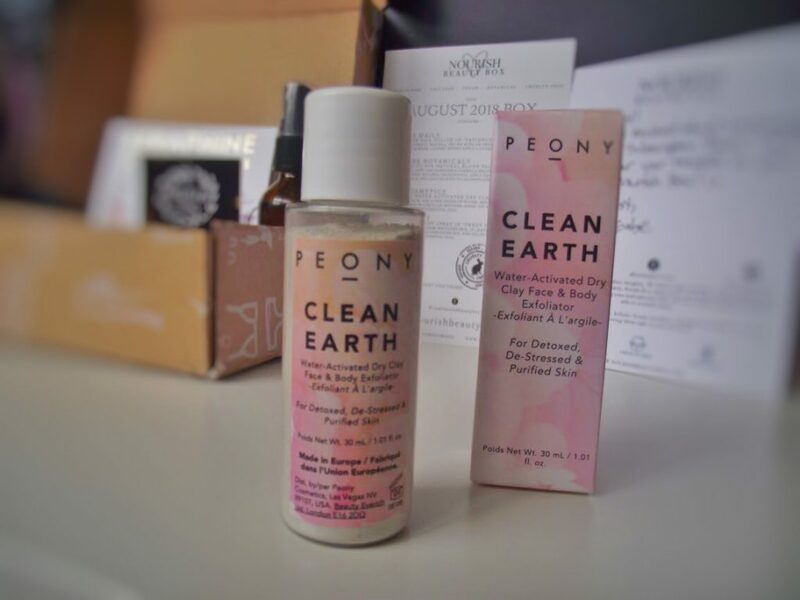 Clean Earth exfoliator by Peony was the last treat in my beauty box for the month! It is a dry clay exfoliator mixed with Norwegian seaweed and bamboo power. I had the treat of using this product shortly after I opened the box. It was a bit surprising to see a dry powder but then I thought about it for a second and realized that it made sense. The exfoliant is water activated so you have to mix a bit of water in with the powder. Once mixed you have a nice spread that can foam slightly. It smells nice and clean and works amazingly for clearing out your pores. The best bonus for this exfoliator is it still leaves your face all clean and fresh! There is zero residue. I am in love with it! Above this you can see the cute note and list that came in the box! 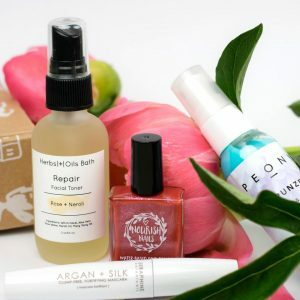 This whole box is natural and cruelty free and all around an awesome buy. I would love to see this box in my mail monthly. 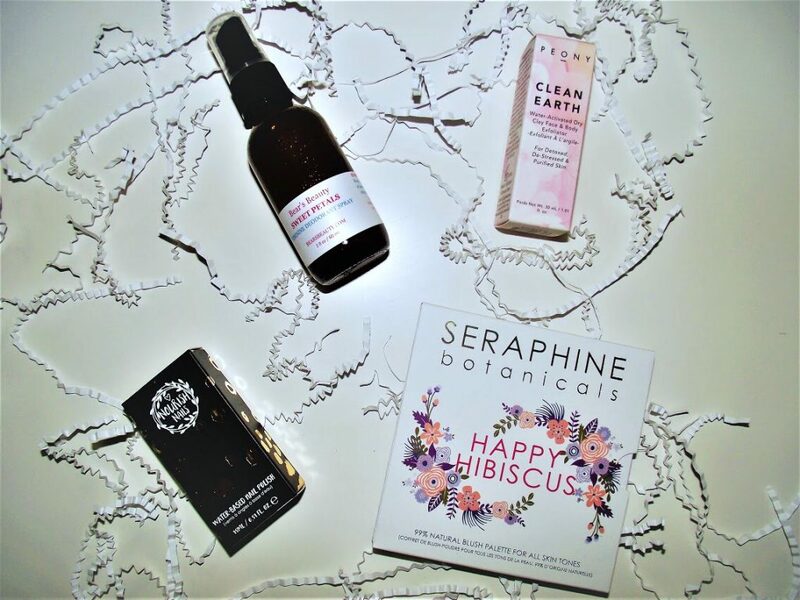 It’s the Nourish philosophy to have natural products, focus on you, and bring out the best in both you and the products you get! 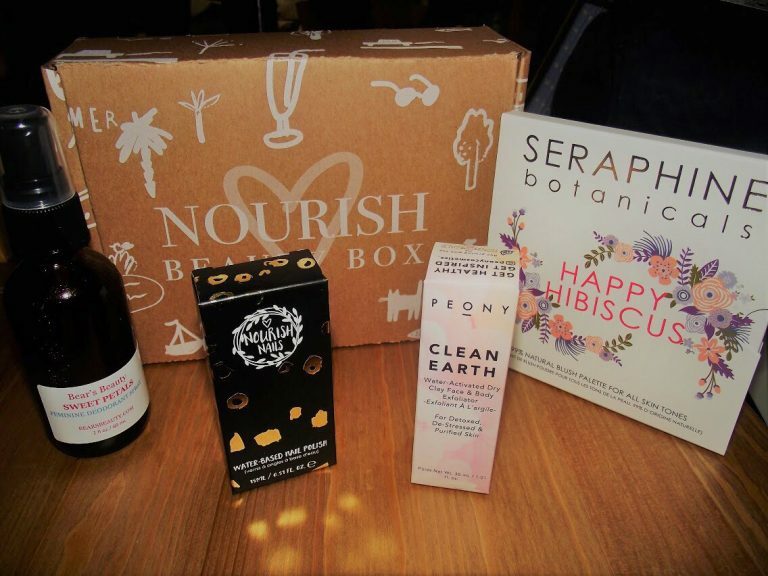 If you are interested in these types of natural beauty products and the Nourish philosophy check it out here and you’ll get 15% off your first order! I love the box completely. 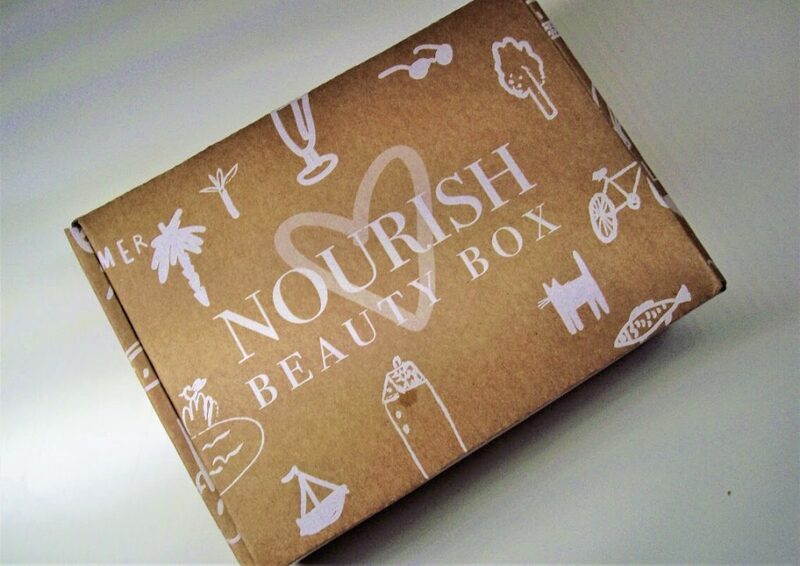 How would you rate Nourish Beauty Box ?